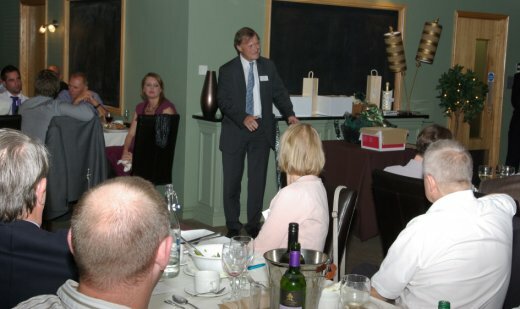 The Caravan Writers’ Guild hosted another capacity dinner at Stonebridge Golf Club, Meriden on 12th October 2011. Ninety-four guests enjoyed a lovely meal in the club’s Bridge restaurant. Guest of honour was David Amess MP who represents the Caravan Club on caravanning matters in parliament. He gave a lively speech and proposed a toast to the Guild. The raffle in aid of the Chairman’s Charity raised £1,143.10 for the Christie Cancer Hospital in Manchester. Chairman Nigel Rosser is a patient at this state of the art complex which has become the largest cancer facility in Europe. It treats more than 40,000 patients each year.